It was a gathering of industry stakeholders, entertainment personalities, upcoming artistes, friends and family as they all came out in their number to show love and support for Kunle Oluwadiya popularly known as Kidkonnect who opened his music studio, Rade Gold to the public in the high brow area of Gbagada Lagos recently. The talented music producer and beat maker Kidkonnect is not a new name in the industry as he has worked with many artistes such as Eldee the don, Ikechuwku, MI, Byrmo, Naeto C, Oladele,Loose Kaynon and a couple of other artistes. The event which had in attendance many industry stakeholders like M.I, Kenny Saint Brown, Andre Blaze, Loose Kaynon, Beazy and a host of other celebrities and upcoming artiste was the official launch of the ultra modern state of the art music recording studio, Rade Gold Studio which is to cater for the needs of artistes through high end quality music production. The event was an evening of fun and relaxation as industry stakeholders, music lovers, friends and fans of Kidkonnect mingled together in an atmosphere of fun. While there was also enough to eat and drink, the guest had a splendid time wining and dining as they listened to choice music by favorite Nigerian artistes and exchanged pleasantries through the evening. 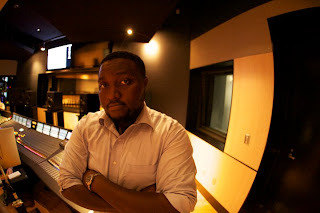 Prior to now, Kidkonnect who was based in the United State of America has also worked with various international artistes and producers in the music industry and has gathered enough experience and skills in the act of music production hence his return home to establish his own studio and take up music production professionally. Definitely not a new comer in the industry, Kidkonnect showed his dexterity on the beats to the amazement of his audience who watched him churn out new beats and kept the audience amazed at how well he knows his onion in the music production aspect of the industry. His expertise which has being featured on many prominent hit tracks can attest to the fact that Kidkonnect is a force to reckon with in the industry and this can be backed with the various awards he has won during his stay in the United state of America such as “The Master” Baltimore Grand Champion, Contrast Hall Beat Battle Champion, and is a three time nominee in the producer of the year category at Cratekings.com.